2004-10-14 Application filed by Deak John C., Gosselink Eugene P., Reilman Randall T. filed Critical Deak John C.
2011-05-12 Assigned to PLASTIC LOGIC LIMITED reassignment PLASTIC LOGIC LIMITED RELEASE BY SECURED PARTY (SEE DOCUMENT FOR DETAILS). Assignors: STATE CORPORATION "RUSSIAN CORPORATION OF NANOTECHNOLOGIES"
A composition containing a silicone-containing polymer for cleaning fabric articles, especially articles of clothing, linen and drapery, with lipophilic fluid provides improved cleaning of soils while providing excellent garment care, especially for articles sensitive to water. This application is a Continuation Application of co-pending U.S. application Ser. No. 10/238,248, filed on Sep. 10, 2002, which claims priority to U.S. Provisional Application Ser. No. 60/318,455 filed Sep. 10, 2001. The present invention relates to compositions for cleaning fabric articles, especially articles of clothing, linen and drapery, wherein the compositions provide improved cleaning of soils while providing excellent garment care for articles sensitive to water. Dry cleaning processes rely on non-aqueous solvents for cleaning. By avoiding water these processes minimize the risk of shrinkage and wrinkling, however, cleaning of soils, particularly water-based and alcohol-based soils is very limited with these processes. Typically, the dry-cleaner removes such soils by hand prior to the dry-cleaning process. These methods are complex, requiring a wide range of compositions to address the variety of stains encountered, very labor intensive and often result in some localized damage to the treated article. Accordingly there is an unmet need, in commercial laundry, in dry-cleaning and in the home, for cleaning compositions, which simultaneously provide acceptable cleaning across a variety of soils while remaining safe for a wide range of fabric articles. Silicone-containing polymers functionalized with hydrogen bonding substituent groups selected from the group consisting of polyols, polyamines, and/or alkanolamines aid soil removal for washing processes using lipophilic fluids, especially decamethylcyclopentasiloxane (known as “D5”), and formulation of products for use therein. The present invention provides compositions which exhibit improved cleaning of soils from fabric articles, while maintaining excellent fabric care properties. The cleaning compositions comprise silicone-containing polymers functionalized with hydrogen bonding substituent groups selected from the group consisting of polyols, polyamines, alkanolamines, and combinations thereof. Optionally, the silicone-containing polymers may be functionalized with additional polar substituent groups selected from the group of amines, monoalcohols, polyalkylene oxides, amides, and combinations thereof. The features and advantages of such cleaning compositions will become apparent to those of ordinary skill in the art from a reading of the following detailed description and the appended claims. All percentages, ratios and proportions herein are by weight, unless otherwise specified. All temperatures are in degrees Celsius (° C.) unless otherwise specified. All measurements are in SI units unless otherwise specified. All documents cited are in relevant part, incorporated herein by reference. where X is H, a hydroxyl or a monovalent hydrocarbon group, and R1 and R2 are independently H or a monovalent hydrocarbon group. Such structures are abbreviated as MDbM where M=XR1 2SiO0.5—, and D=—O0.5Si(R2)2O0.5—. One or more primes, such as D′ or M′, is used to indicate one or more of the R1 or R2 groups is substituted for a non-siliconcontaining organic group R.
The unsubstituted polysiloxane segments of the polymers of the invention comprise units, —SiR2 2O— in which R1 and R2 are selected from the group of C1-C22 alkyl, aryl, arylalkyl, fluoroalkyl and combinations thereof. The preferred R1 and R2 groups are methyl. These polymers include copolymers of functionalized monomeric units with non-functionalized monomeric units (i.e., not all the monomeric units are funtionalized) and polymers made up of siloxane monomeric units and non-siloxane monomeric units. Block, random, star, graft, and other types of copolymers are also included. “Functionalized”, as used herein, means the indicated substituent groups are chemically bonded to the silicone-containing polymer. A “functional unit”, as used herein, means one substituent group used to functionalize the silicone-containing polymer. The silicone-containing polymers useful for the present invention may contain only a single functional unit, but may also contain two or even many functional units per polymer. “Polyol substituents”, as used herein, means a functional unit containing more than one hydroxyl group per functional unit. “Polyamine substituents”, as used herein, means a functional unit containing more than one amino group per functional unit. Amino groups useful herein include unsubstituted amino groups as well as mono and di-substituted amino groups (typically the mono and di-substitution is with a C1-C6 alkyl moiety). “Alkanolamine substituents”, as used herein, means a functional unit containing at least one hydroxyl group and at least one amino group per functional unit. “Combinations thereof” with respect to the non-optional functional units, as used herein, means the silicone-containing polymer is functionalized with at least one polyol substituent and at least one polyamine substituent, or is functionalized with at least one polyol substituent and at least one alkanolamine substituent, or is functionalized with at least one polyamine substituent and at least one alkanolamine substituent. With respect to the optional functional units, the term “combinations thereof” means that in addition to one or more non-optional functional unit, the silicone-containing polymer may be functionalized with any combination of optional units selected from monoamines, monoalcohols, polyalkylene oxides, and amides. The term “cleaning composition” and/or “treating composition” used herein is intended to mean any lipophilic fluid-containing composition that comes into direct contact with fabric articles to be cleaned. It should be understood that the term encompasses uses other than cleaning, such as conditioning and sizing. Furthermore, optional cleaning adjuncts such as surfactants, bleaches, and the like may be added to the “cleaning composition”. That is, cleaning adjuncts in addition to the silicone-containing polymer may be optionally combined with the lipophilic fluid. These optional cleaning adjuncts are described in more detail herein below. Such cleaning adjuncts may be present in the cleaning compositions of the present invention at a level of from 0.001% to about 10% by weight of the cleaning composition. The term “consumable detergent composition” means any composition, that when combined with a lipophilic fluid, results in a cleaning composition according to the present invention. The term “processing aid” refers to any material that renders the consumable detergent composition more suitable for formulation, stability, and/or dilution with a lipophilic fluid to form a cleaning composition in accordance with the present invention. The present invention provides compositions which exhibit improved cleaning of soils (i.e., removal and/or reduction of soils) from fabric articles, while maintaining excellent fabric care properties. Alkoxylated amine and polyol functionalities have the ability to penetrate and/or dissolve water-soluble and water-based soils. However, these functionalities are typically not soluble in lipohilic fluids such as D5. For improved hydrophilic cleaning, the present invention compositions utilize silicone-containing polymers to which these functionalities are appended onto highly soluble polymers, like polysiloxanes. For solubility in lipophilic fluids, particularly D5, the sum of the dialkylsiloxane, alkylarylsiloxane, diarylsiloxane, and fluoroalkylsiloxane content (silicone content) should be >60% of the mass of the entire polymer. 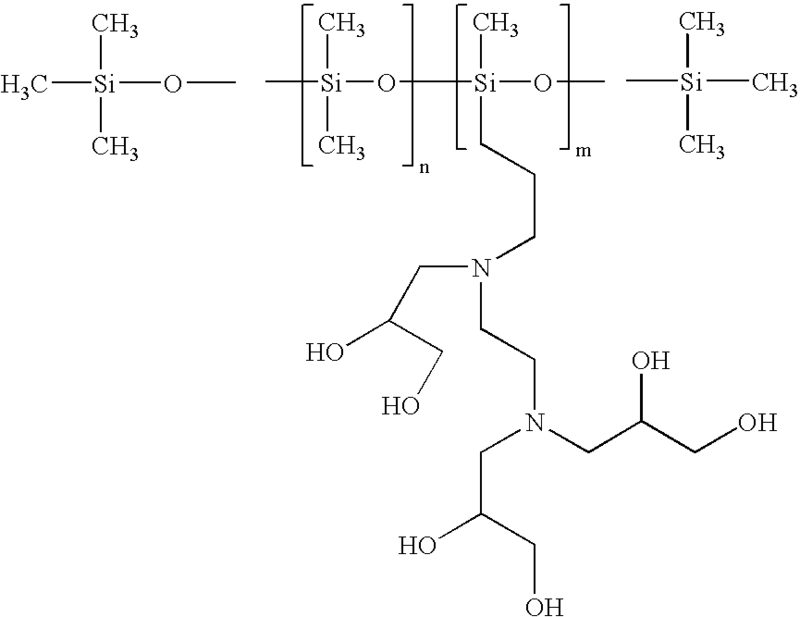 This is calculated from the molecular weight of the siloxane backbone, not including non-silicon containing organic groups that have been substituted for R1, divided by the molecular weight of the entire molecule and multiplied by 100 to express as a percentage. Examples for specific structures are shown in Table 1. In these specific examples, only one of the R2 groups of each D′ is substituted for R (i.e. D′=—O0.5SiR2RO0.5—. These polymers provide a cleaning additive for cleaning (including dry-cleaning) in lipophilic fluids that has the appropriate chemical forces for penetrating or interacting strongly with water-soluble and water-based soils and is highly soluble so that the soil can be suspended in the lipophilic fluid. wherein m is from 1 to 100 and n is from 2 to 200, and wherein further m is less than half of n. Preferred molecular weights are in the range of from about 1,000 to about 20,000. Conveniently, these materials can be made from commercially available polysiloxanes and amino silicones. Although the 100% siloxane backbone is preferred, other organic monomeric units may be included in the silicone-containing polymers. The poly alcohol, polyamine, and alkanolamine appendages may be pendant or terminal (i.e. ABA structure). Pendant ethyleneoxy (“EO”), proplyeneoxy (“PO”), and ethyleneoxy/propyleneoxy (“EO/PO”) substitutions are also envisioned in combination with at least one of the non-optional substitutents. The silicone-containing polymers are present in the cleaning compositions of the present invention at levels from about 0.001% to about 2%, more preferably from about 0.01% to about 1.0%, even more preferably from about 0.02% to about 0.5% by weight of the cleaning composition. The silicone-containing polymers are present in the consumable detergent compositions of the present invention at levels from about 0.01% to about 10%, more preferably from about 0.05% to about 5%, even more preferably from about 0.1% to about 2.0% by weight of the consumable detergent composition. To a 250 ml, single neck, round bottom flask equipped with a magnetic stir bar and water cooled condenser with argon inlet is added 15 grams of Poly(dimethylsiloxane-co-methylhydrosiloxane), trimethylsilyl terminated polymer (containing 4% methylhydrosiloxane, Aldrich product code: 482374), 1.06 grams (0.008 moles) of 3-Allyloxy-1,2-propandiol (Aldrich product code: 25173-9), 0.01 grams of H2PtCl6 (Aldrich product code: 20608-3), 0.05 grams of 2,2,6,6-tetramethyl-4-piperidinol (Aldrich product code: 11574-6) and 50 ml of Toluene (‘Baker Analyzed’ A.C.S. Reagent). With mixing under argon, reaction mixture is heated at reflux for 2.5 hours then let to cool to room temperature (23° C.). 15 grams of Amberlyst A-21 is added and the mixture heated at 80-90° C. for 15 hours, cooled to room temperature and filtered to recover a clear, pale yellow solution with a small insoluble phase (moisture from Amberlyst). The toluene layer is decanted away from water droplets and concentrated to recover a viscous, dark orange liquid. Proton NMR (CDCl3) shows a resonance at 0.5 ppm representing —SiCH2CH2CH2OCH2CH(OH)CH2OH, a resonance at 1.6 ppm representing —SiCH2CH2CH2OCH2CH(OH)CH2OH and a resonance at 3.43 ppm representing —SiCH2CH2CH2OCH2CH(OH)CH2OH and the disappearance of resonances at 5.21 ppm representing CH2═CHCH2OCH2CH(OH)CH2OH and 5.95 ppm representing CH2═CHCH2OCH2CH(OH)CH2OH indicating the methylhydrosiloxane units have reacted with the 3-allyloxy-1,2-propanediol to form the desired product. —SiCH2CH2CH2NH(CH2CH(OH)CH2OH) indicating full derivatization of the aminopropyl units with glycidol units. The lipophilic fluid herein is one having a liquid phase present under operating conditions of a fabric/leather article treating appliance, in other words, during treatment of a fabric article in accordance with the present invention. In general such a lipophilic fluid can be fully liquid at ambient temperature and pressure, can be an easily melted solid, e.g., one which becomes liquid at temperatures in the range from about 0 deg. C to about 60 deg. C, or can comprise a mixture of liquid and vapor phases at ambient temperatures and pressures, e.g., at 25 deg. C and 1 atm. pressure. Thus, the lipophilic fluid is not a compressible gas such as carbon dioxide. An optional but highly preferred ingredient in the cleaning compositions and consumable detergent compositions according to the present invention is a surfactant. The surfactant component useful for the present invention is a material that is capable of suspending water in a lipophilic fluid and enhancing soil removal benefits of a lipophilic fluid. The materials may be soluble in the lipophilic fluid. D″ is R6 2SiO2/2 wherein R6 is independently H, a monovalent hydrocarbon group or (CH2)1(C6H4)m(A)n-[(L)O-(A′)p-]q-(L′)rZ(G)s, wherein I is 1-10; m is 0 or 1; n is 0-5; o is 0-3; p is 0 or 1; q is 0-10; r is 0-3; s is 0-3; C6H4 is unsubstituted or substituted with a C1-30alkyl or alkenyl; A and A′ are each independently a linking moiety representing an ester, a keto, an ether, a thio, an amido, an amino, a C1-4 fluoroalkyl, a C1-4 fluoroalkenyl, a branched or straight chained polyalkylene oxide, a phosphate, a sulfonyl, a sulfate, an ammonium, and mixtures thereof; L and L′ are each independently a C1-30 straight chained or branched alkyl or alkenyl or an aryl which is unsubstituted or substituted; Z is a hydrogen, carboxylic acid, a hydroxy, a phosphato, a phosphate ester, a sulfonyl, a sulfonate, a sulfate, a branched or straight-chained polyalkylene oxide, a nitryl, a glyceryl, an aryl unsubstituted or substituted with a C1-30alkyl or alkenyl, a carbohydrate unsubstituted or substituted with a C1-10alkyl or alkenyl or an ammonium; G is an anion or cation such as H+, Na+, Li+, K+, NH4+, Ca+2, Mg+2, Cl−, Br−, I−, mesylate or tosylate. Nonlimiting commercially available examples of suitable organosulfosuccinate surfactants are available under the trade names of Aerosol OT and Aerosol TR-70 (ex. Cytec). Another preferred class of surfactants is nonionic surfactants, especially those having low HLB values. Preferred nonionic surfactants have HLB values of less than about 10, more preferably less than about 7.5, and most preferably less than about 5. Preferred nonionic surfactants also have from about 6-20 carbons in the surfactant chain and from about 1-15 ethylene oxide (EO) and/or propylene oxide (PO) units in the hydrophilic portion of the surfactant (i.e., C6-20 EO/PO 1-15), and preferably nonionic surfactants selected from those within C7-11 EO/PO 1-5 (e.g., C7-11 EO 2.5). The non-silicone additive (i.e., materials do not contain an Si atom), when present, which preferably comprises a strongly polar and/or hydrogen-bonding head group, further enhances soil removal by the compositions of the present invention. Examples of the strongly polar and/or hydrogen-bonding head group-containing materials include, but are not limited to alcohols, cationic materials such as cationic surfactants, quaternary surfactants, quaternary ammonium salts such as ammonium chlorides (nonlimiting examples of ammonium chlorides are Arquad materials commercially available from Akzo Nobel) and cationic fabric softening actives, nonionic materials such as nonionic surfactants (i.e., alcohol ethoxylates, polyhydroxy fatty acid amides), gemini surfactants, anionic surfactants, zwitterionic surfactants, carboxylic acids, sulfates, sulphonates, phosphates, phosphonates, and nitrogen containing materials. In one embodiment, non-silicone additives comprise nitrogen containing materials selected from the group consisting of primary, secondary and tertiary amines, diamines, triamines, ethoxylated amines, amine oxides, amides and betaines, a nonlimiting example of a betaines is Schercotaine materials commercially available from Scher Chemicals and mixtures thereof. In yet another embodiment, primary alkylamines comprising from about 6 to about 22 carbon atoms are used. Particularly preferred primary alkylamines are oleylamine (commercially available from Akzo under the trade name Armeen OLD), dodecylamine (commercially available from Akzo under the trade name Armeen 12D), branched C16-C22 alkylamine (commercially available from Rohm & Haas under the trade name Primene JM-T) and mixtures thereof. wherein R1 is C8-C16 alkyl, each of R2, R3 and R4 is independently C1-C4 alkyl, C1-C4 hydroxy alkyl, benzyl, and —(C2H40)xH where x has a value from 2 to 5, and X is an anion. Not more than one of R2, R3 or R4 should be benzyl. Especially preferred are alkyl ethoxylate surfactants with each R8 being C8-C16 straight chain and/or branch chain alkyl and the number of ethyleneoxy groups s being from about 2 to about 6, preferably from about 2 to about 4, more preferably with R8 being C8-C15 alkyl and s being from about 2.25 to about 3.5. These nonionic surfactants are characterized by an HLB of from 6 to about 11, preferably from about 6.5 to about 9.5, and more preferably from about 7 to about 9. Nonlimiting examples of commercially available preferred surfactants are Neodol 91-2.5 (C9-C10, s=2.7, HLB=8.5), Neodol 23-3 (C12-C13, s=2.9, HLB=7.9) and Neodol 25-3 (C12-C15, s=2.8, HLB=7.5. Further nonlimiting examples include nonionic surfactants selected from the group consisting of fatty acid (C12-18) esters of ethoxylated (EO5-100) sorbitans. More preferably the surfactant is selected from the group consisting of mixtures of laurate esters of sorbitol and sorbitol anhydrides; mixtures of stearate esters of sorbitol and sorbitol anhydrides; and mixtures of oleate esters of sorbitol and sorbitol anhydrides. Even more preferably the surfactant is selected from the group consisting of Polysorbate 20, which is a mixture of laurate esters of sorbitol and sorbitol anhydrides consisting predominantly of the monoester, condensed with about 20 moles of ethylene oxide; Polysorbate 60 which is a mixture of stearate esters of sorbitol and sorbitol anhydride, consisting predominantly of the monoester, condensed with about 20 moles of ethylene oxide; Polysorbate 80 which is a mixture of oleate esters of sorbitol and sorbitol anhydrides, consisting predominantly of the monoester, condensed with about 20 moles of ethylene oxide; and mixtures thereof. 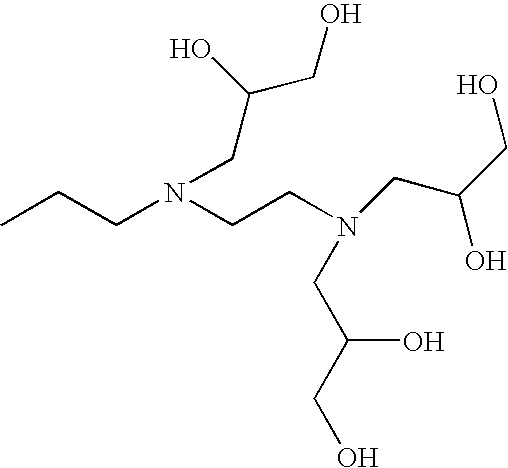 Most preferably, the surfactant is Polysorbate 60. Compositions according to the present invention may further comprise a polar solvent. Non-limiting examples of polar solvents include: water, alcohols, glycols, polyglycols, ethers, carbonates, dibasic esters, ketones, other oxygenated solvents, and mixutures thereof. Further examples of alcohols include: C1-C126 alcohols, such as propanol, ethanol, isopropyl alcohol, etc. . . . , benzyl alcohol, and diols such as 1,2-hexanediol. The Dowanol series by Dow Chemical are examples of glycols and polyglycols useful in the present invention, such as Dowanol TPM, TPnP, DPnB, DPnP, TPnB, PPh, DPM, DPMA, DB, and others. Further examples include propylene glycol, butylene glycol, polybutylene glycol and more hydrophobic glycols. Examples of carbonate solvents are ethylene, propylene and butylene carbonantes such as those available under the Jeffsol tradename. Polar solvents for the present invention can be further identified through their dispersive (□D), polar (□P) and hydrogen bonding (□H) Hansen solubility parameters. Preferred polar solvents or polar solvent mixtures have fractional polar (fP) and fractional hydrogen bonding (fH) values of fP>0.02 and fH>0.10, where fP=□P/(□D+□P+□H) and fH=□H/(□D+□P+□H), more preferably fP>0.05 and fH>0.20, and most preferably fP>0.07 and fH>0.30. The compositions of the present invention may optionally further comprise one or more other cleaning adjuncts. The optional cleaning adjuncts can vary widely and can be used at widely ranging levels. Bleaches, especially oxygen bleaches, are another type of cleaning adjunct suitable for use in the compositions of the present invention. This is especially the case for the activated and catalyzed forms with such bleach activators as nonanoyloxybenzenesulfonate and/or any of its linear or branched higher or lower homologs, and/or tetraacetylethylenediamine and/or any of its derivatives or derivatives of phthaloylimidoperoxycaproic acid (PAP; available from Ausimont SpA under trademane Euroco) or other imido- or amido-substituted bleach activators including the lactam types, or more generally any mixture of hydrophilic and/or hydrophobic bleach activators (especially acyl derivatives including those of the C6-C16 substituted oxybenzenesulfonates). Nonlimiting examples of finishing polymers that are commercially available are: polyvinylpyrrolidone/dimethylaminoethyl methacrylate copolymer, such as Copolymer 958®, molecular weight of about 100,000 and Copolymer 937, molecular weight of about 1,000,000, available from GAF Chemicals Corporation; adipic acid/dimethylaminohydroxypropyl diethylenetriamine copolymer, such as Cartaretin F4® and F-23, available from Sandoz Chemicals Corporation; methacryloyl ethyl betaine/methacrylates copolymer, such as Diaformer Z-SM®, available from Mitsubishi Chemicals Corporation; polyvinyl alcohol copolymer resin, such as Vinex 2019®, available from Air Products and Chemicals or Moweol®, available from Clariant; adipic acid/epoxypropyl diethylenetriamine copolymer, such as Delsette 101®, available from Hercules Incorporated; polyamine resins, such as Cypro 515®, available from Cytec Industries; polyquaternary amine resins, such as Kymene 557H®, available from Hercules Incorporated; and polyvinylpyrrolidone/acrylic acid, such as Sokalan EG 310®, available from BASF. Preferred insect and moth repellent cleaning adjuncts useful in the compositions of the present invention are perfume ingredients, such as citronellol, citronellal, citral, linalool, cedar extract, geranium oil, sandalwood oil, 2-(diethylphenoxy)ethanol, 1-dodecene, etc. Other examples of insect and/or moth repellents useful in the compositions of the present invention are disclosed in U.S. Pat. Nos. 4,449,987; 4,693,890; 4,696,676; 4,933,371; 5,030,660; 5,196,200; and in “Semio Activity of Flavor and Fragrance Molecules on Various Insect Species”, B. D. Mookherjee et al., published in Bioactive Volatile Compounds from Plants, ACS Symposium Series 525, R. Teranishi, R. G. Buttery, and H. Sugisawa, 1993, pp. 3548, all of the patents and publications being incorporated herein by reference. The method of the present invention comprises contacting a fabric article in need of cleaning with a silicone-containing polymer. Such methods include processes such as pretreating the fabric article with a consumable detergent composition containing silicone-containing polymer prior to contacting the fabric article with a lipophilic fluid. Another method of the present invention involves contacting fabric articles in need of cleaning with a cleaning composition comprising lipophilic fluid and silicone-containing polymer, preferably in an automatic washing machine. 1. A consumable detergent composition comprising silicone-containing polymers functionalized with pendant polyamine substituents, and optionally with polyol substituents, alkanolamine substituents, or both. 2. The consumable detergent composition according to claim 1 wherein the silicone-containing polymer is further functionalized with at least one optional unit selected from the group consisting of monoamines, monoalcohols, polyalkylene oxides, amides, terminal polyamines, and combinations thereof. 3. The consumable detergent composition according to claim 1 wherein the composition further comprises a lipophilic fluid. 4. The consumable detergent composition according to claim 3 wherein the lipophilic fluid comprises a linear or cyclic siloxane. 5. The consumable detergent composition according to claim 3 wherein the lipophilic fluid comprises a cyclic siloxane selected from the group consisting of octamethylcyclotetrasiloxane, decamethylcyclopentasiloxane, and dodecamethylcyclohexasiloxane, and mixtures thereof. 6. The consumable detergent composition according to claim 3 wherein the lipophilic fluid comprises decamethylcyclopentasiloxane. 7. The consumable detergent composition according to claim 1 wherein the composition further comprises at least one optional ingredient selected form the group consisting of polyether siloxane surfactants, organosulfosuccinate surfactants, cationic surfactants, quaternary surfactants, quaternary ammonium salts, cationic fabric softening actives, nonionic surfactants, anionic surfactants, Gemini surfactants, zwitterionic surfactants, polar solvents, processing aids, and mixtures thereof. 8. The consumable detergent composition according to claim 1 wherein the composition further comprises at least one adjunct selected from the group consisting of builders, enzymes, bleach activators, bleach catalysts, bleach boosters, bleaches, alkalinity sources, antibacterial agents, colorants, perfumes, pro-perfumes, finishing aids, lime soap dispersants, odor control agents, odor neutralizers, polymeric dye transfer inhibiting agents, crystal growth inhibitors, photobleaches, heavy metal ion sequestrants, anti-tarnishing agents, anti-microbial agents, anti-oxidants, anti-redeposition agents, soil release polymers, electrolytes, pH modifiers, thickeners, abrasives, divalent or trivalent ions, metal ion salts, enzyme stabilizers, corrosion inhibitors, diamines or polyamines and/or their alkoxylates, suds stabilizing polymers, fabric softening agents, optical brighteners, hydrotropes, suds or foam suppressors, suds or foam boosters and mixtures thereof. 9. A cleaning composition comprising a lipophilic fluid and silicone-containing polymers functionalized with pendant polyamine substituents, and optionally with polyol substituents, alkanolamine substituents, or both. 10. The cleaning composition according to claim 9 wherein the lipophilic fluid comprises a linear or cyclic siloxane. 11. The cleaning composition according to claim 9 wherein the lipophilic fluid comprises a cyclic siloxane selected from the group consisting of octamethylcyclotetrasiloxane, decamethylcyclopentasiloxane, and dodecamethylcyclohexasiloxane, and mixtures thereof. 12. The cleaning composition according to claim 9 wherein the lipophilic fluid comprises decamethylcyclopentasiloxane. 13. The cleaning composition according to claim 9 wherein the silicone-containing polymer polymer is further functionalized with at least one optional unit selected from the group consisting of monoamines, monoalcohols, polyalkylene oxides, amides, terminal polyamines, and combinations thereof. 14. The cleaning composition according to claim 9 wherein the composition further comprises at least one optional ingredient selected form the group consisting of polyether siloxane surfactants, organosulfosuccinate surfactants, cationic surfactants, quaternary surfactants, quaternary ammonium salts, cationic fabric softening actives, nonionic surfactants, anionic surfactants, Gemini surfactants, zwitterionic surfactants, polar solvents, processing aids, and mixtures thereof. 15. The cleaning composition according to claim 9 wherein the composition further comprises at least one adjunct selected from the group consisting of builders, enzymes, bleach activators, bleach catalysts, bleach boosters, bleaches, alkalinity sources, antibacterial agents, colorants, perfumes, pro-perfumes, finishing aids, lime soap dispersants, odor control agents, odor neutralizers, polymeric dye transfer inhibiting agents, crystal growth inhibitors, photobleaches, heavy metal ion sequestrants, anti-tarnishing agents, anti-microbial agents, anti-oxidants, anti-redeposition agents, soil release polymers, electrolytes, pH modifiers, thickeners, abrasives, divalent or trivalent ions, metal ion salts, enzyme stabilizers, corrosion inhibitors, diamines or polyamines and/or their alkoxylates, suds stabilizing polymers, fabric softening agents, optical brighteners, hydrotropes, suds or foam suppressors, suds or foam boosters and mixtures thereof. 16. A method for cleaning fabric articles, the method comprising the step of contacting a fabric article in need of cleaning with the cleaning composition of claim 9. 17. A method for cleaning fabric articles, the method comprising the step of contacting a fabric article in need of cleaning with the consumable detergent composition of claim 1. 18. The method according to claim 17 wherein the fabric article in need of cleaning is contacted with the consumable detergent composition of claim 1, in the presence of a lipophilic fluid. 19. The method according to claim 18 wherein the lipophilic fluid comprises a cyclic siloxane. 20. The method according to claim 17 wherein the method comprising the step of pretreating the fabric article with the detergent composition of claim 1 prior to contacting the fabric articles with a lipophilic fluid. ES2316346T3 (en) 2000-10-27 2009-04-16 THE PROCTER &amp; GAMBLE COMPANY Treatment for clothes to confer resistance against wrinkles dry.